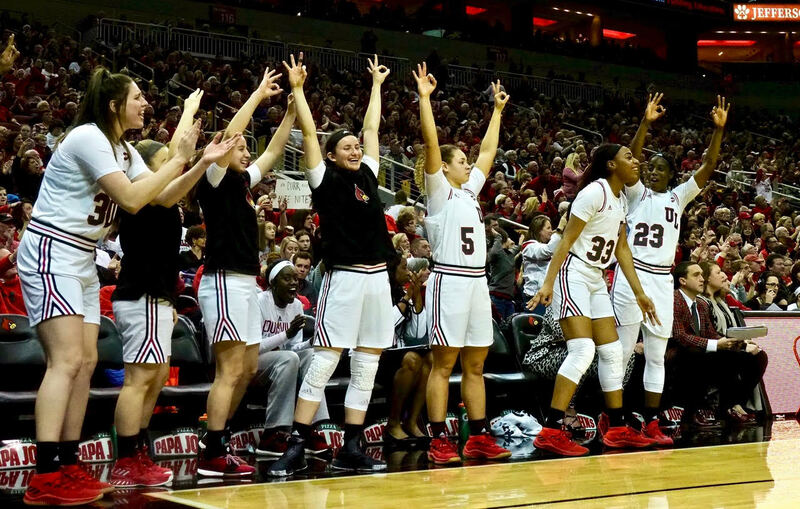 Louisville women sock UConn, 17,023 rock the Yum! 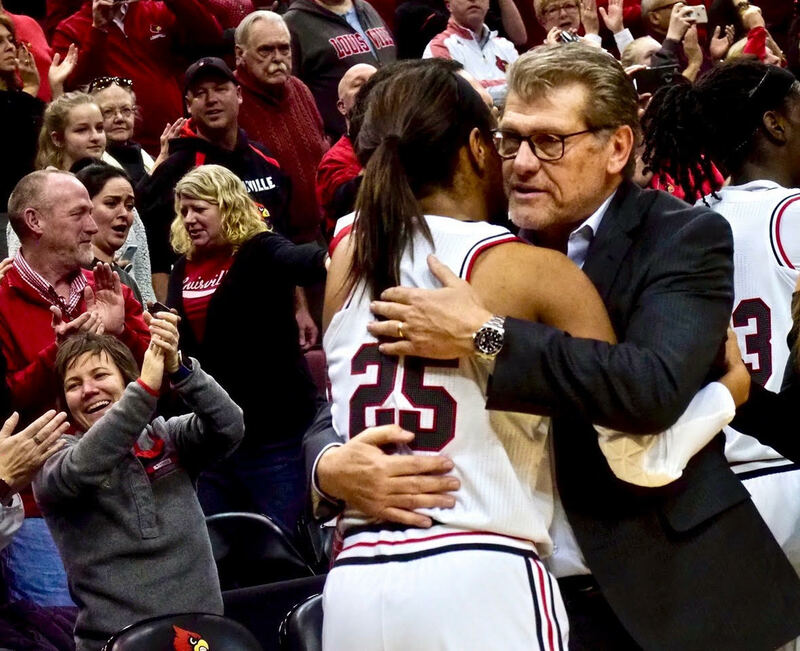 Louisville’s Asia Durr is embraced by UConn Coach Geno Auriemma following UofL’s win (top photo). The Louisville bench erupts following one of five 3-pointers by Dana Evans. 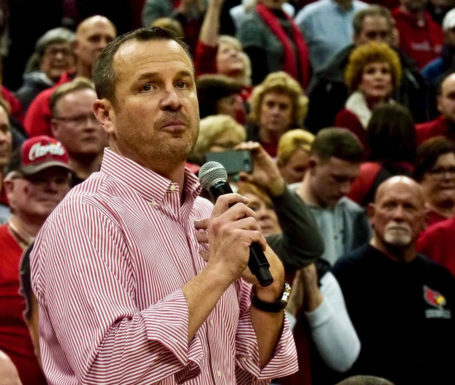 Below, UofL Coach Jeff Walz thanks the crowd of 17,023 for all the support (Cindy Rice Shelton photos). A long time between wins, so many futile efforts, numerous beatings at the hands of UConn over two decades. Two days before Ground Hog Day, concern and fear about another possible blowout. Been there in many of those 17 straight losses. 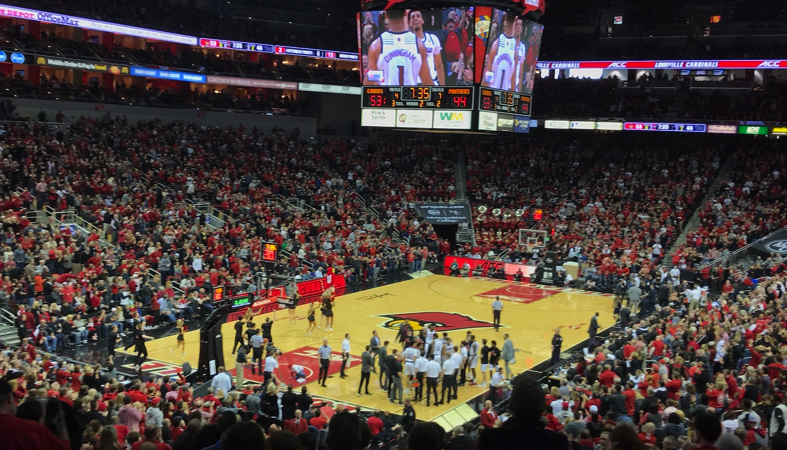 The largest crowd to see a women’s college basketball game of 17,023 were on hand at the KFC Yum! Center. In the past, hang with them for a couple of baskets, throw the ball away a couple of times, and wave goodbye. That scenario quickly coming to mind with UConn jumping out to a 6-2 lead. Here we go again? Not this time, not with this year’s edition of the University of Louisville women’s basketball team. Not even with leading scorer Asia Durr being held scoreless in the first quarter, missing all four of her field goal attempts. Not to worry, Jazmine Jones, Sam Fuehring and Dana Evans were taking up the slack, unfazed by the opponent, giving Asia time to find her shooting touch. No intimidation, no regrets, no coulda, woulda, shoulda’s this time around, a premier performance in front of a national ESPN television audience and a crowd of 17,023 fans at the KFC Yum! Center. Third-ranked Louisville handing second-ranked UConn a 78-69 defeat, their second loss of the season. Improving their own record to 20-1 in the process. “At the end of the first quarter, Asia was sitting there on the chair and I told her to smile,” said Coach Jeff Walz. “Put a smile on your face. It’s 21-21 and you’ve got great teammates. Embrace that and enjoy it. Durr would warm up quickly in the second quarter, hitting her first 3-pointer in the first 54 seconds. She would follow that up with three more 3-pointers and 14 of her team’s 19 points to give UofL a 40-38 lead at the half. She would lead all scorers with 24 points for the game. Evans would wind up with 20 points, including five 3-pointers. Fuehring and Jones would each have double-doubles — Fuehring with 10 points and 12 rebounds, Jones with 13 points and 12 rebounds. Auriemma said UofL players play well together, they know their roles and play good defense. “Jeff has built a tremendous program here,” he concluded. 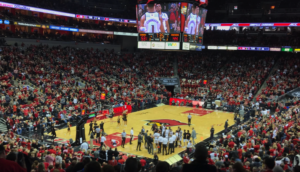 Author Charlie SpringerPosted on February 1, 2019 February 1, 2019 Categories BasketballTags Asia Durr, Jamine Jones, Jeff Walz, Louisville women's basketball, Sam Fuehring, UConn2 Comments on Louisville women sock UConn, 17,023 rock the Yum!